32-Core CPUs is coming with gigahertz race largely released from the AMD and Intel,trying to improve processing power and aid with multitasking operations. AMD and Intel both are trying to put more and more cores on a single CPU. These 32-nanometer processors will be in the market soon. 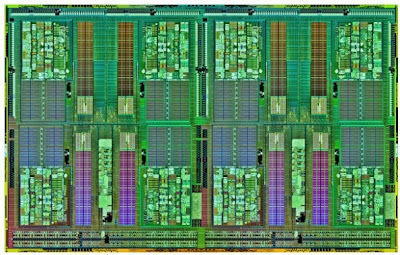 These cores and other components will be fitted over miniaturizing chip onto a limited space. This processor is the collection of Turbo-Boost technology and Hyper-Threading technology. These technologies enable the 32 core processor to work with high process application.Intel named this 32 Core processor “Kelifer” which is a combination of 32 brains and they can work for the user at a time. And it’s just a small chip which carries all the components in one small space.32 Core processor enables highly threaded applications with high process applications. Miniaturization of chips will continue to fitting these cores and 32-Core CPUs will be built around a paradigm that will allow them to have plug-in and add-on abilities. This project had to be launched in 2009-10 but due to some problem, the team of developers were confused that how to fit these 32 cores in one chip. So it was becoming difficult to handle all the 32 cores with the current CPUs. Finally To solve all these complexities developers need some time and effort. Intel and AMD jointly said that they will surely complete this project soon and they will start working with more cores in future.